Here are my top favorites out of Architectural Digest’s top 50 most pinned photos for the year. Don’t expect a DIY manual or craft tutorial for any of these interior design ideas today. Let’s call this top 10 the ‘Ultimate Inspiration’ instead for how to create our own Fabulous Interior Designs. Perhaps we can find a few DIY projects to do from the ideas shown in these wonderful shots, so that we can ‘take them home’. You can see from my collection of sample interior design ideas that I still have that old Italian farm idea my head, even though we moved to London, UK, now… Italy. Will it ever leave my soul?! It is hard to give these top 10 numbers from 1 to 10 as I love them all. So, one on my top favorite interior designs is this barn style living room that is filled with Ralph Lauren décor. 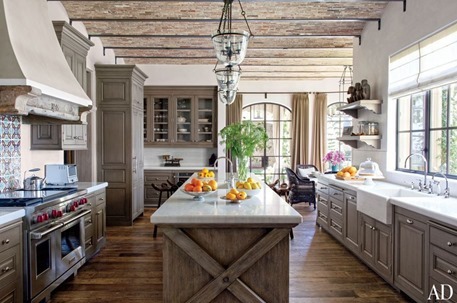 This elegant farm style kitchen is something I can only dream of. Practical and beautiful and ultimately very livable. I could see myself getting freshly squeezed orange juice in the morning in this kitchen. Don’t you? This is my real favorite porch style picture. I just love it. It is hard to tell if this room is inside or outside. Comfortable, relaxed and oh so elegant … all at the same time. While it is reminiscent of an Italian farm, this living room filled with wooden beams and wicker furniture is really in Southern California, I believe. 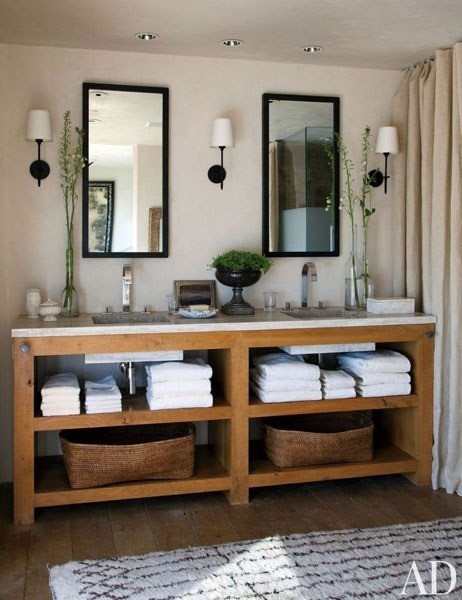 This seems like an achievable bathroom, a la restoration hardware. It is however custom-designed. 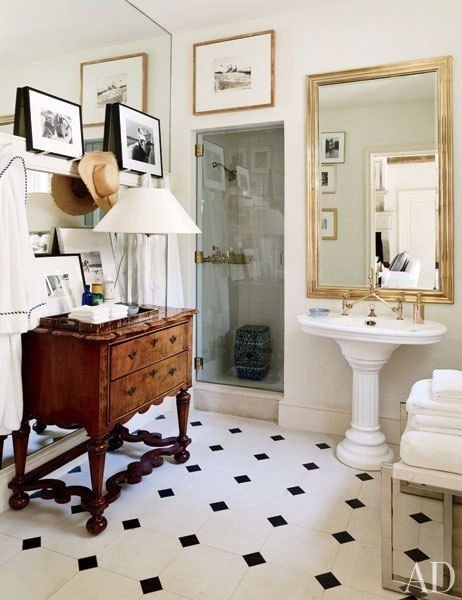 In contrast to this bathroom, which is loaded with personal character and definitely more European in style. Love them both! I like this bedframe, the monochromatic nature of the bedroom and the elegance. Beautiful as a 5 star hotel bedroom. 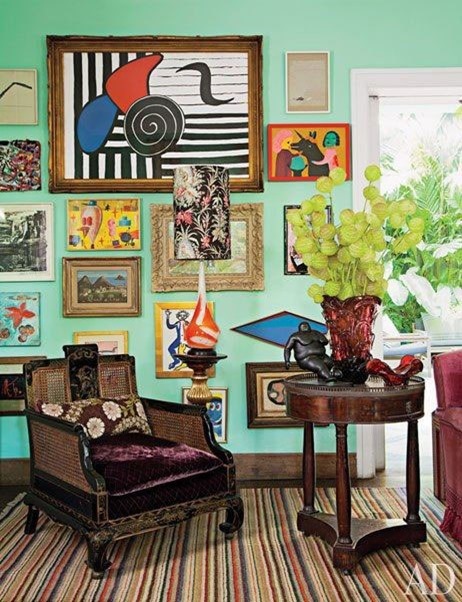 This São Paulo house is so exotically and eclectically artistic and so cheery. It feels like a Saturday morning and you are about to meet the artist in his bathrobe. (smile). I love the monochromatic design of this designer bedroom. The next photo made me gasp. I my goodness, I just A D O R E this garden pool. Again, feels like a wonderful 5 star resort to me, and I want to go there this upcoming summer. Gorgeous. It’s in Miami. 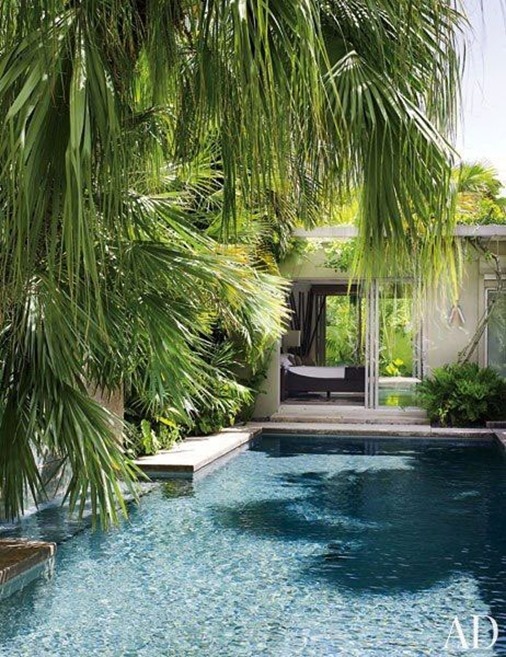 Last but not least, this pool is of a famous, but not too outlandishly famous writer, in Key West, Florida. 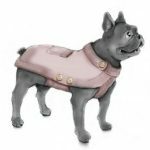 Oh, may…. 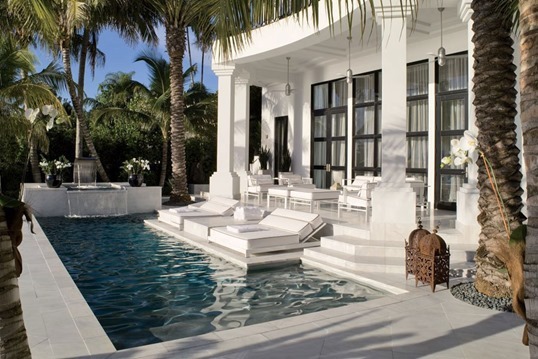 Who would not want to wake up in this bed and then put a bathing suit on and dip into this pool? How refreshing. Learn the details about these favorite interior designs and garden designs at the Architectural Digest website, as well as the 40 other top pinned design ideas. Want to learn how to improve your own interior design? Learn from veteran interior designer Betsy Speert, and take advantage of her free interior design tutorial. Gorgeous photos and insightful home decor ideas for living room colors! She’s also a celebrated designer for famous design magazines and author of several design books. 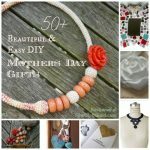 Go check out her free interior design tutorial. « Coolest Crochet Slippers Patterns for Boys ..Sneakers! My favorites are the farm-style kitchen and the porch. I’m totally smitten with the kitchen, and its long large windows are what I yearn for in the future. I love light and being able to look on on my gardens. The idea of a living room style outdoor porch for enjoying a warm summer day….or using the fireplace in the fall would be so amazing. Hope all is well and you’re enjoying your ‘new’ home. Best wishes for a blessed and prosperous New Year!